Mrs. Thynne's Samoyede, Karawitch, at 60, Tremaine Road, Anerley, London, S.E. 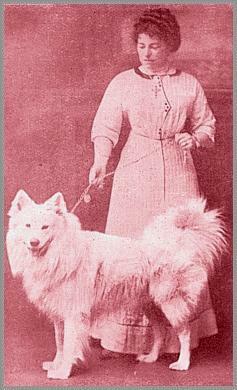 WHEN dog fanciers in after years turn up the files of the canine Press of 1912 they will discover that one of the, if not the, sensations of the Palace Show of 1912 was the presence there of Mrs. Thynne's striking Samoyede, KARAWITCH — an exhibit that, figuratively, caused fanciers of the sledge-dog to pause and rub their eyes in admiring surprise. The adjectives of superlative, praise which were heaped on Karawitch on that occasion would have been ridiculous and exaggerated had they not been so thoroughly deserved, and such truthful descriptions of the dog as he really is. One of the largest and finest Samoyedes which the show bench has ever seen, Karawitch possesses that elegance and power which are a combination so eagerly sought after but so seldom attained, and which give the Samoyede that has them a distinctiveness owned by no other breed. Mrs. Thynne's name may be unfamiliar to the majority of Samoyede lovers, but when we say that Kara was given to her by her father, the late Dr. John Muter, Mrs. Thynne ceases to be a stranger to the “ Samoyede people” of Britain. Karawitch was bought by Dr. Muter for his daughter to replace one which died of distemper when a year old, and perhaps the reason for Karawitch being such a huge and splendid dog is attributable to the fact that he was brought up in the country—at Horley, in Surrey, where Mrs. Thynne lived with her father. By Nansen and Russolene, and a very ungainly puppy, Kara quickly grew into a big dog, and at eight months old he weighed 45lb. Fearful of distemper, his owner did not exhibit him. Indeed, Karawitch was never out of the grounds at Horley until he was two and a half years old and Dr. Muter would not hear of him being shown. But folk said it was such a pity that such a fine specimen of his breed should not be exhibited, and so Karawitch went to the Palace, with the results already mentioned. Karawitch has never been ill, is the essence of sweet temper, and an ideally charming companion. Mrs. Thynne has now another strand binding her to the fancy, for she was elected, by unanimous choice, the first treasurer of the recently formed Ladies’ Samoyede Association.